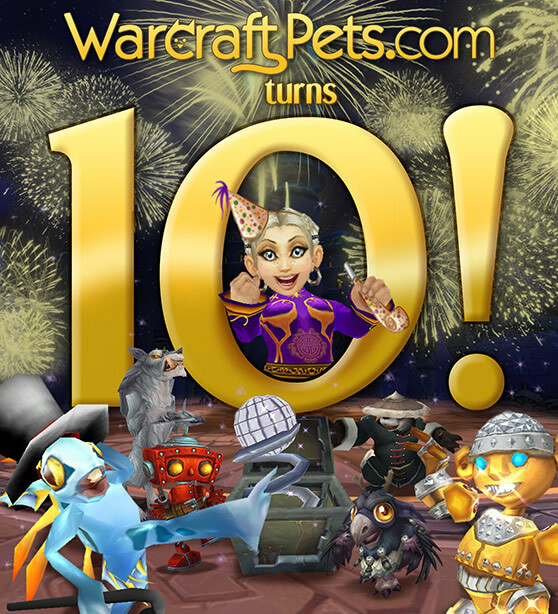 WarcraftPets Turns 10, Celebrating Ten Years of Pet Collecting! That's 10 years of collection tracking, pet-related news, and fostering an amazing community made up of remarkable pet collectors like you! Throughout the past decade, there have been some major milestones for WarcraftPets. Here are just a few of the notable events that occurred over the past 10 years. 2007: WarcraftPets comes online. Later that year, users were given the ability to track their pet collections online. 2009: Breanni was honored in-game with an NPC in Dalaran! We also held our first BlizzCon WarcraftPets Meet-and-Greet. 2010: Improved pet filters, comments on pet pages, and other site quality of life improvements. We bid a fond farewell to Sateena, our first Content Manager. And we welcomed both Quintessence and Weena as they joined the team. 2011: We launched our community forums and debuted World of Petcraft, a fun monthly comic. 2012: The entire website was updated with a fresh new look, improved collection tracking, and we added extensive filters for not only pets, but also abilities. 2014: Our first Pet of the Month feature was published, and we added even more site tools to help with your collecting and battling needs. 2015: We added additional filters to search for pets, and a comment section on our all of our news posts. 2016: Our beloved Community Leader, Doobjanka, stepped down after 6+ amazing years of dedication to this website and its community — he is still sorely missed. 2017: We took a look back at some of our most popular April Fool's posts that have always been good for a laugh... and sometimes a scare! We've said it before, but we can never say it enough: thank you, our site members and fans, once again for supporting our site with your regular visits. We'd especially like to thank our Site MVPs for their ongoing contributions to the site. I never imagined WarcraftPets would get as big as it did all those years ago when I coded it from scratch. But in the end, all I created were the bones of this site — it's all of you who supply its lifeblood. Thanks for sticking with us for so long. While I may have created this site a decade ago, it wouldn't exist today without the help of two very important volunteers — Quintessence and Weena. Both have spent countless hours building and adding content to WarcraftPets over the years. Their tireless efforts and devoted contributions cannot be understated. I encourage you to offer them your heartfelt thanks and appreciation in the comments below. Without their work, this site probably wouldn't have endured for five years, let alone ten. Their time and talents have been instrumental to WarcraftPets' success. Now it's your turn — join in the celebration! The next time you log into WoW, take out your favorite pet and give it a /cheer on our behalf! May your travels through the World of Warcraft continue to be filled with exciting pet battles and lovable companions. Meanwhile, our site will continue to inspire, inform and entertain you as you build the ultimate pet collection. Happy 10th Birthday Warcraftpets! Thank you for all the love and effort that went into this wonderful site and thank you to the community for helping it become the go to spot for pet lovers. I hope we will have another 10 years to enjoy pet collecting. Pet collecting wouldn't be nearly as much fun or as easy without this site. Thank you so very much for your hard work and dedication!!!!! Thank you all for creating a wonderful, informative place to learn more and understand more about our shared passion of pet collecting. I remember the days when you had to pick your pets by hand, and tell the system if it was a multi character collection or just one toon....I remember being SO SCARED I was going to put in a pet I didn't have by mistake and have my account closed. Those were the "dark days" of pet collecting. Now I have life-long internet friends and a massive collection of companion pets. Happy Anniversary, WCP, and may we all have another 10 years! Happy anniversary, and thanks for being such a great, up-to-date resource for pet collectors everywhere! Looking forward to many more years of hunting, farming, and researching! Amazing that 10 years went by already lol, congratz! Thanks for everything you do. My collection wouldn't be half of what it is today without this site. Thank you for all your hard work over the years, your site is invaluable. Kudos to Breanni for creating this lovely home for pet collectors worldwide and to Quintessence and Weena for all their awesomesauce. My respect and appreciation are limitless! I think all your work has been great and helpful thanks! Congratulations! This has been a great site for pet collectors. Thank you for all of your hard work! thanks for all the work and creating a little comunity of pet collectors.